Can JVC's LT-26DE1BJ live up to its relatively expensive price tag? The LT-26DE1BJ is a fantastic space-saving option as it comes equipped with an integrated digital recorder with 160GB of memory. What's more, as this model has two digital tuners, it enables you to record two channels simultaneously. The Freeview+ badge means you'll also benefit from series recording and the ability to pause live TV. The glossy black chassis is matched by an elegant blue light under the JVC logo. Despite looking a little flimsy, the four-legged stand does its job and even swivels left and right to establish the best viewing position. The clear onscreen menus make recording extremely easy. However, the remote control is far too long and heavy, and the most regularly used buttons are located at the foot of the handset, making it quite uncomfortable to use. Images are clean with clearly defined edges, while colours are reproduced with vibrancy and accuracy. 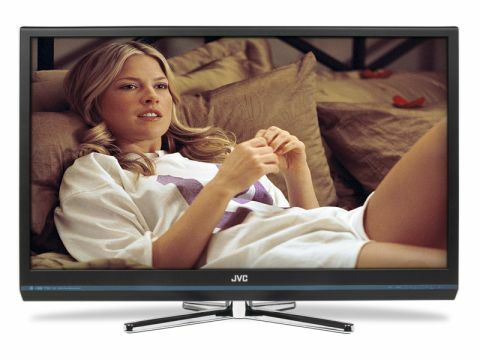 The JVC also makes light work of fast action motion, producing far less judder than most screens at this size. The speakers are cleverly concealed beneath the screen and deliver surprisingly good sound, considering their size. As well as offering a strong performance on standard TV broadcasts, they also do a pretty good job with bass-heavy movie soundtracks. It's certainly not the cheapest 26in panel money can buy, but excellent picture performance and the inclusion of Freeview+ are compelling arguments in its favour.